Utilising Roland's advanced ACB technology, the System-8 is a revolutionary new hybrid synthesizer with a vast palette of sounds. Inspired b..
Utilising Roland's advanced ACB technology, the System-8 is a revolutionary new hybrid synthesizer with a vast palette of sounds. Inspired by four decades of iconic Roland Synthesizers like the Jupiter, Juno, SH and V-Synth, combined with Roland's modern JD-Xi and System 500 technology, the System-8 is a powerful studio monster. Roland's proprietary Analog Circuit Behaviour engine is designed to accurately recreate classic analogue synth sounds via cutting-edge digital modelling techniques. Featuring 8 voices of polyphony, 3 oscillators including a Sub Osc, high-res filters and a stunning array of parameter controls, the System 8 is Roland's most comprehensive synth to date. Split and layer synths for unheard of sounds, and tap into the integrated vocoder, arpeggiator, CV/Gate outs, and advanced polyphonic step sequencer to fuel endless creative explorations. Tons of top-notch effects are on hand for adding character and ambience, from overdrive, distortion, and fuzz to delay, chorus, reverb, and more. And just like the numerous synth parameters, the effects have grab-and-go controls that make it simple to enhance sounds as you play. The Roland System-8 features a familiar TR-Rec style interface. It's possible to perform and trigger loop sequences in real time, with the functionality and creative control as featured on the acclaimed Aira TR-8. The Arpeggio function is equipped with quick-access knobs for switching patterns and styles as you play, while Chord Memory allows you to trigger polyphonic note stacks with a single key. The SYSTEM-8 even has an advanced vocoder built in, offering another expressive option for delivering unique and memorable synth performances. 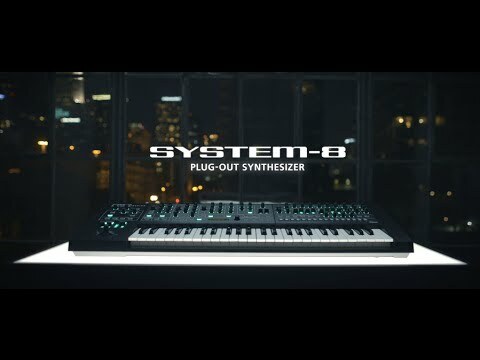 Integrating System 8 with your current studio or live set-up is easy. With a simple USB interface built-in, it's easy to connect to PC or Mac to use as a Plug-Out interface, MIDI controller or Audio Soundcard. With the built-in CV/Gate outputs, you can send note/pitch data from the synth engine and step sequencer to trigger your modular synths and retro gear. Roland's Plug-Out technology provides seamless workflow between software and hardware. As a collection of regular Virtual Instruments, they can be played and manipulated like regular VSTs and Plug-Ins. Simply connect a Roland System Plug-Out synthesizer via USB, click Plug-Out, and you've got all the parameters, sounds and characteristics of up to 3 synths loaded wherever you go. 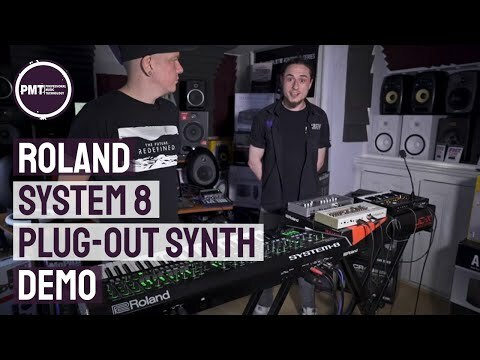 In addition to its impressive internal sound engine, the SYSTEM-8 features three expansion slots for hosting and controlling Roland’s PLUG-OUT software synths. JUPITER-8 and JUNO-106 PLUG-OUTs are included, giving you immediate access to authentic sonic reproductions of these Roland classics. Optional PLUG-OUTs such as the SH-2, SH-101, PROMARS, and others are supported as well. Using the SYSTEM-8’s Performance mode, you’re able to combine the internal synth engine and hosted PLUG-OUTs to create super-synth patches with layered voices, custom splits, and more.